Busy weekdays call for fast dinners. If I can get it all into one pot, even better. But not every weeknight is like that for Rob and I. Sometimes I cook a more involved recipe but generally try to keep even that under one hour. These speedy mushroom ramen bowls helps me accomplish two things. Dinner is ready in under 30 minutes, and clean-up is a snap. At its most basic, vegan ramen is a noodle-filled bowl full of both. The noodles vary as widely as the broth base. Some ramen broth recipes require hours to prepare properly, but I tend to stick to the quicker variety and simply add miso to the broth. A miso base my favorite ramen base because not only is it plant-based, but it imparts umami and earthy flavors to the overall recipe. A noodle bowl at its finest! I used to think ramen was those cheap packs of wavy noodles I could buy at the grocery store. You know, the ones that come in a styrofoam cup or tear-apart package with a salty flavor pack inside? 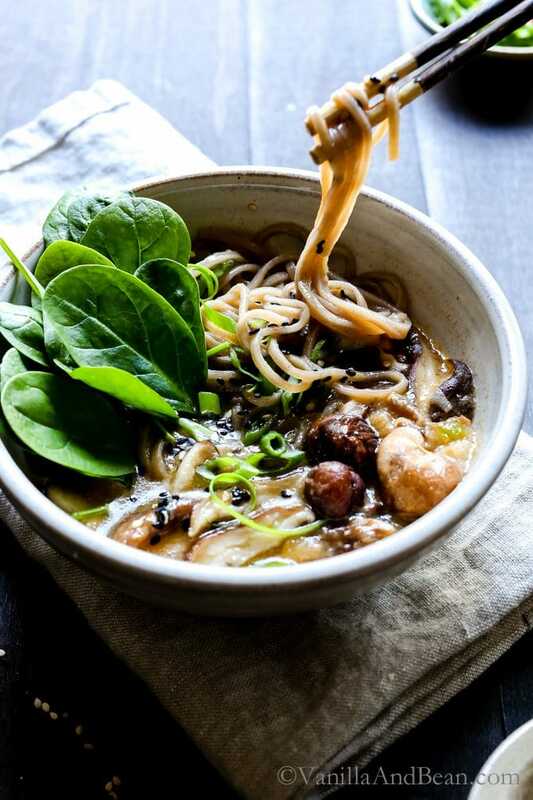 A homemade mushroom ramen noodle bowls are SO easy and waaay better for us anyway. First, start with a bit of oil. 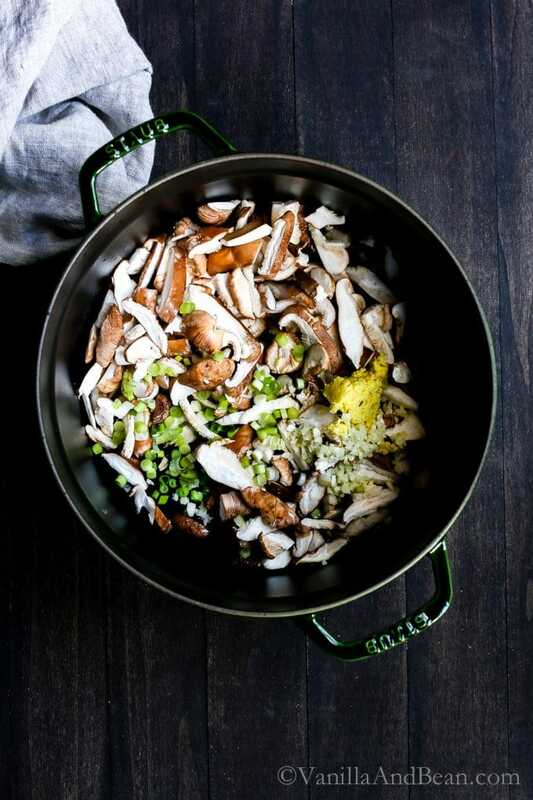 Add grated garlic and ginger with some sliced green onions and mushrooms. Sear the mushrooms with the aromatics, then add the broth. Next, bring the mixture to a boil, then add the noodles. Cook for five minutes, then add a miso slurry. Last, stir in spinach and garnish with green onions and sesame seeds. 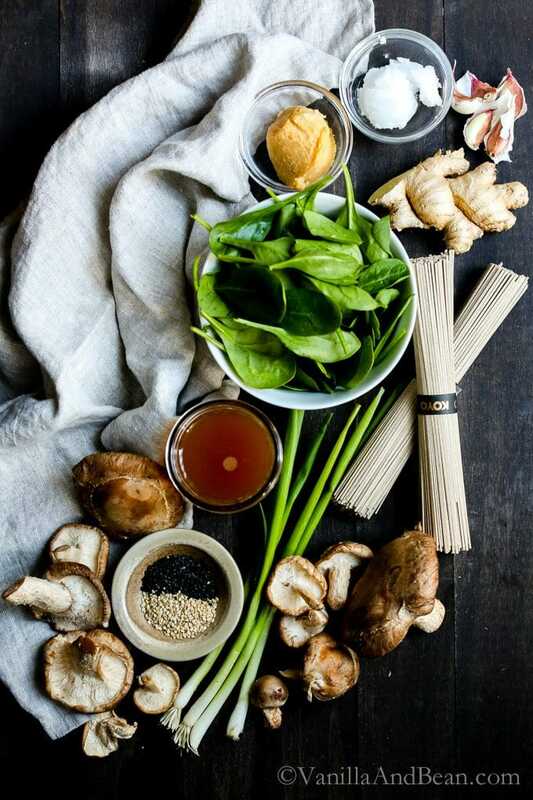 I love sharing mushroom ramen bowls with fresh spinach so that it wilts down into the hot broth. Add a squeeze of sriracha, green onion tops, plenty of sesame seeds, tamari, to taste and dinner. is. DONE! This vegan ramen can be made gluten-free, but I have difficulty finding organic 100% buckwheat soba noodles. The brand I buy includes a mix of wheat and buckwheat. Rice noodles would be a delicious sub however. What’s your fast go-to weeknight dinner? Do you have a favorite? Please share below and drop a link! In a Dutch oven (non stick is very helpful here), heat oil until shimmering. 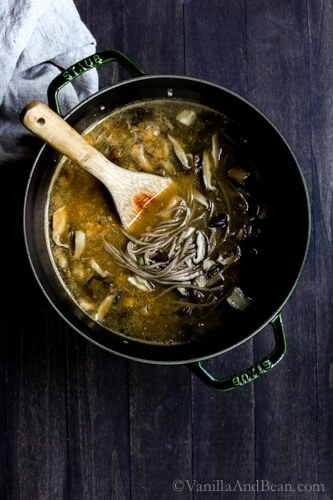 Turn the heat down to medium low to low and add the mushrooms, ginger, garlic, and white parts of the onions. 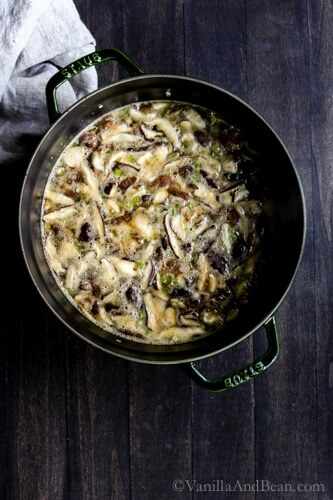 While the pot will be crowded, allow the bottom layer of mushrooms to cook for a few minutes before stirring. This will help the mushrooms sear a bit. Stir occassionally for about 6 minutes. You'll notice the garlic and ginger stick to the bottom of the pot (but watch the heat because you don't want the garlic and ginger to burn). Just scrape the garlic and ginger when you stir the mushrooms. When the broth is added, the pan will deglaze and those bits will add delicious flavor! Add the broth, water and bring to a boil. Scoop out about a cup of broth and set aside to cool a bit. Once boiling add the noodles to the pot, turn down to medium and simmer for five minutes or until the noodles are tender. Remove from heat. Add the miso paste to the cup of broth and and whisk to dissolve. Pour the miso slurry into the ramen pot and stir. Taste for seasoning adjustment and add Tamari if a more salty taste is desired. Ladle into soup bowls, top with a handful of spinach and sprinkle with sesame seeds. Serve immediately with extra spinach, sesame seeds, sriracha, herbs, tamari and onion greens. Store leftovers in a lidded container, in the refrigerator, for up to three days. *Find miso paste in the refrigerated section of the grocery store. Recipe inspired by Power Foods. Just discovered this page and had to try this recipe today, made some adjustments, but it was wonderful. I took out the vegetable broth, added some soy sauce, some tofu and about two spoons of peanut butter add protein. Had a lot of mixed mushrooms that I needed to use so I made the soup and saved for future soups before adding the noodles. That way next time when I am in a hurry I’ll just take it out of the freezer and put in the noodles for a quick fix. Thank you for your idea, I will keep looking through your recipes as I’m sure I will make a lot more of them. this was so easy and came together so quick!! I had 2 big portobellos and used those but followed all the rest of your how to on this one. Keeping this one for sure and honestly cant tell my fellow fans how wonderful this seemingly basic recipe is. I added red chili pepper flakes at the end :) YUM!! Oh so happy to read, Suzi! I love the addition of red chili pepper flakes at the end… I’ll add them next time I make it! Thank you for coming back and leaving a note – day made! This was SUPER! Vegan teen, vegetarian husband and “flexitarian” teen and mom thought it was great! Flex teen isn’t a fan of mushrooms but loved the broth. This will definitely be part of our meal rotation. Thank you! Hello! Can I just cook this on my stovetop instead of using a Dutch Oven (which I don’t have)? Hi Danielle! Yep, that’ll be fine! I made this tonight and the house smelled so good!! I couldnt wait to eat it! We have two picky eater kids and i was really worried they would not like it but they came home and even said it smelled good and then they ate it all!! Oh i was so happy!! This is delicious! I will definitely be making this many many times!! Thank you!! Hi Alissa! 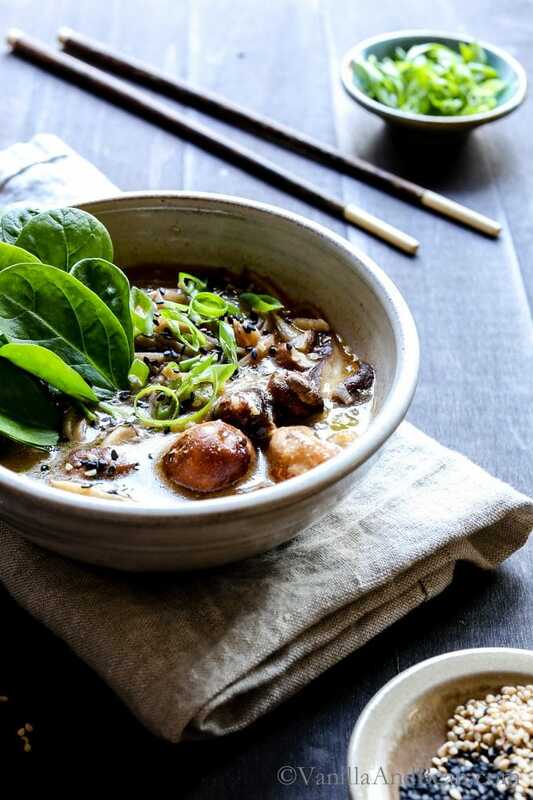 Since miso is a umami flavor builder (and such a nutritious powerhouse) leaving it out will change the intended flavor profile – but understand your need to omit it. It is very salty tasting however, so to balance the flavors without it, I’d go for either adding more Tamari to taste or sub tahini with additional Tamari to taste. I hope this helps, Alissa and you enjoy the recipe! Wow! This recipe delights all the senses. 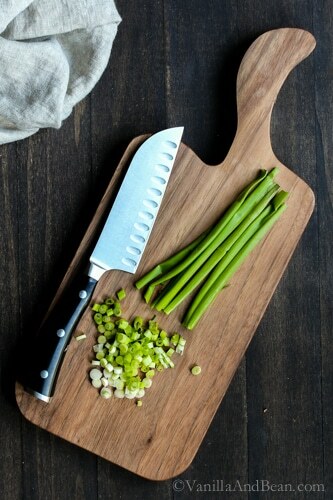 Delicious and hearty, full of aromatics and umami flavors and healthful, whole, scrumptious ingredients. You knocked it out of the park again, sister! Made this for dinner for an out-of-town, meat-loving guest. He didn’t miss the meat at all. All he could say was Wow. Wow. Wow. Over and over again. The black sesame seeds and green onions for garnish were a hit. We SO enjoyed this recipe. I can always count on anything from your site being spectacular. Thank you! Hooray! So happy to hear you two enjoyed this one! Easy, peasy, right? And the garnish? I’m totally with you! Thank you for your note sistah! 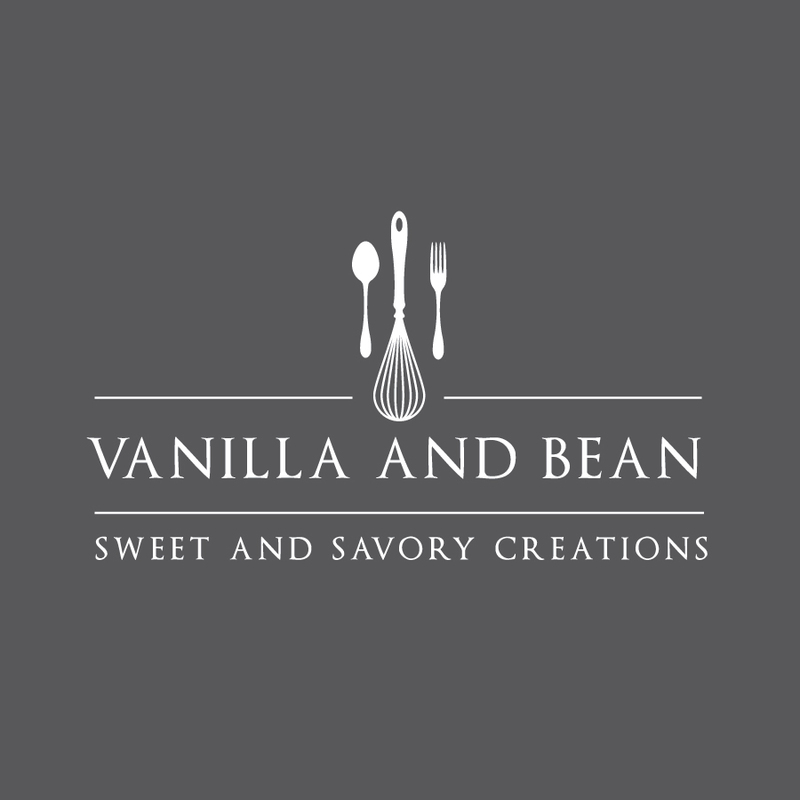 I often come across your recipes on Foodgawker and Pinterest, and I’m just drawn in. Your photography inspires me and your recipes look amazing. Can’t wait to try this bowl of deliciousness! Thank you so much Tricia! I hope you enjoy this one.. it’s really quick to pull together. Thank you for sharing. My husband and I tried this last night and it was very good. wild mushroom Ramen is one of my all-time favorite meals. Minimal ingredients and work, yet so impressive and nourishing. I could eat this every day, all winter. And I love your photos! Soups containing MISO should not be boiled after the miso is added. It destroys the probiotic benefit of the miso. Thanks to you and Barbara for letting me know about this! I’m somewhat new to miso, so I’ve since done some reading on it and have updated the recipe. Thank you again, BJ! What a reminder of how simple food can be breathtakingly beautiful, Traci. Thank you for this. We often have noodles bowls similar to this, although mine don’t look quite as stylish as yours. :) I love the ginger, garlic, scallion, and miso combination. So good to catch up on all of your posts! Ramen bowls are truly the best for busy night, especially when it is so cold outside. I also love the addition of miso as it not only tastes good, but also gives it a great umami flavor. And the mushrooms.. SO SO yummy my friend. Ah, I love ramen, I love under 30-minute meals and even better are one-pot meals. This dish is perfection! Adding this to my meal plan for next week. I love ramen bowls! One of my favorite go to dinners, but my son and husband are not fans so I do not make it as often as I would like to! I love your version which looks so easy and simple to make! I will have to try this! I get the organic buckwheat noodles from Wholefoods, although not sure if it is gluten free or not. As always, I simply love how methodical,crisp and wonderfully styled your pictures are! I love mushroom ramen but must confess that I’ve never made it at home. Now I have no reason to put it off any longer – your recipe looks so mouthwatering! This ramen looks amazing! The only ramen I have made was in those cheepo noodle cups :p. Need to try it from scratch one of these days. That sounds just so comforting! Perfect for the kind of rain we have been facing, and I love the flavor of miso. Agreed, Kankana! It’s been raining so much here too… so a hearty and filling noodle bowl is such a good way to warm up. I’m with ya on the Miso too! 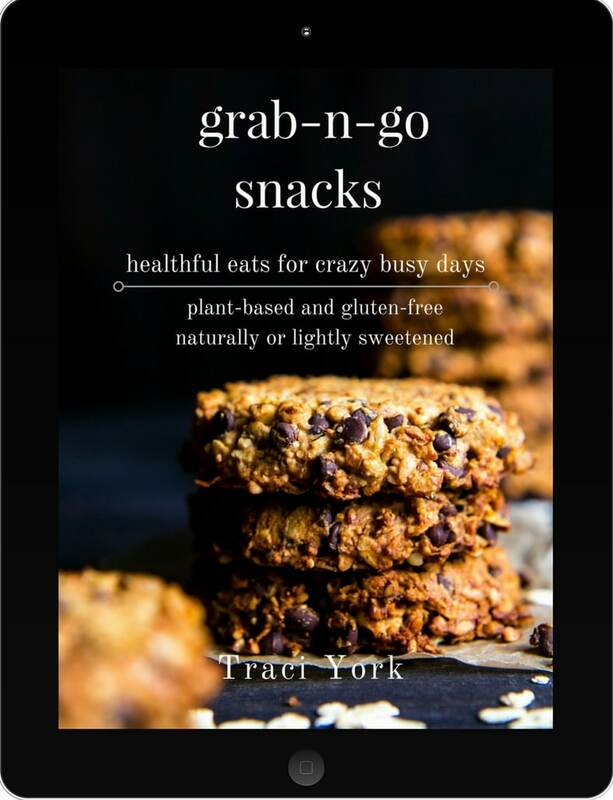 This looks amazing, Traci! My quickie dinner is a “hash” of sauteed mushrooms, diced veg like broccoli or cabbage, maybe artichoke hearts, spinach, and chickpeas with an egg and some cheese. This is by far the most beautiful bowl of ramen I’ve ever seen! In college I went through a period where I lived on the packaged ramen, but i’ve never actually eaten the homemade good stuff before. 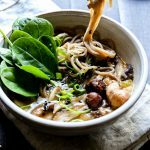 I love miso and I love noodle bowls though so I’m thinking I need to give this a try asap! I’m always in need to speedy dinners! I have never tried those little styrofoam containers of ramen Traci. It just never seemed appetizing to me. But boy oh boy does this ramen! And some of my most favorite quick weeknight meals are pasta, so this one will fit right in the routine. I absolutely think Tom would also enjoy this one! I’ll let you know! It was in my younger days.. I didn’t know what to eat as a young adult.. or how to cook for that matter. It’s been a slooow evolution for me :D I defiantly prefer this! I hope you and Tom enjoy it Mary Ann! My fast go to dinners are usually pasta dishes, Traci. And do you know that I’ve never tried Ramen noodles before – isn’t that crazy? I think it’s because I’m worried that the restaurant will use chicken or fish stock in the broth. But I didn’t realize how easy it is to make – so thanks for the great recipe – will definitely be trying this! UGH- this looks SO good!! I haven’t had ramen since I was a teenager because of how horrible the packaged kind is for you. Basically, this is my dream come true. I love that it’s so easy to make and is packed full of umami flavor. You hit it out of the park with this one, Traci! I don’t think you are supposed to boil broth after adding Miso. It destroys something beneficial. Thanks for the tip, Barbara! I think it might be okay to add the miso after the noodles are cooked.. I’ll give this a try next time! I can almost taste this savoury soup! 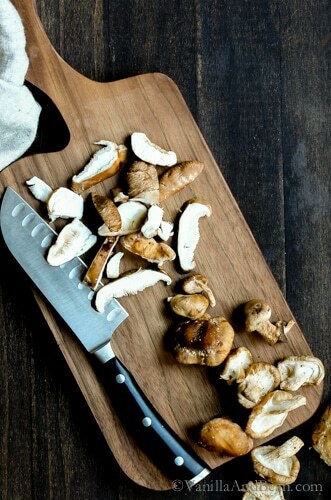 Love the delicious build of aromatics- seared shiitake mushrooms are HEAVEN! It’s SO easy, Abby! I hope you enjoy it! Potent indeed!! I knew you’d be a fan, Sarah!